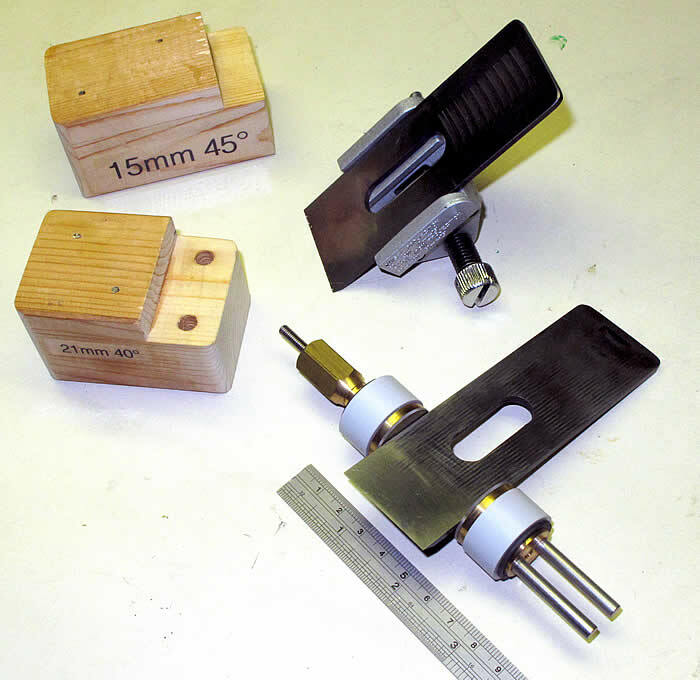 In yesterday’s post, I “talked” about three different honing guides. To help illustrate the Pro and Cons of the 2 best solutions, I offer the following illustration. The no-name guide (top) enables an easy registration (create your own jigs) and ensuring a square face for repeatable edges. Though, with its smaller centered roller in the under carriage, you need to be careful that you do not roll side to side. The Richard Kell guide (lower) is stable quality tool, but what comes with this is a wide base (need to work on glass with paper or wide stones (3″ minimum width)) and blade needs to supported as it wants to fall back. I should note I have two different blades in – the top unit has a blade fitted for a “new era” Stanley 9 1/2 Block Plane which is wider than the blade below for my Lie-Nielson Block Plane, Standard Angle. Though I have included some links to other external websites, it is likely over the years, these links will break. Once they do, please “Google” it.